A year into business, the taps are flowing strong at Gainesville’s second craft brewery. Eric Dreyer has both a bachelor’s degree and master’s degree in food science from the University of Florida, which is why some of his friends might have been amused by his most recent career move. The 29-year-old Dreyer left the security of a research position in the tasting lab at UF’s Institute of Food and Agricultural Sciences for the unpredictable ebbs and flows of a local startup—and he couldn’t be happier. That local startup is First Magnitude Brewing Co. and, as an award-winning, craft-beer home brewer, Dreyer is doing something he is passionate about. “I was happy with my job at the university, but this was too good an opportunity to pass up,” Dreyer said, pointing to the shiny, 15-barrel brew house that constitutes FM’s production facility a block off South Main Street in Gainesville. Dreyer and John Denny, one of First Magnitude’s four co-founders, collaborated on most of the brewery’s recipes. One in particular, for Skinny Dip amber ale, was based on one of Dreyer’s home-brewing recipes. Fresh off celebrating its first anniversary in August, First Magnitude’s distinctive mermaid logo has become a common sight on taps at a number of local establishments. FM’s distribution territory extends eastward to St. Augustine. The brewery’s name refers to the highest-volume, or first-magnitude, natural springs found in the area (as well as to the brightest stars in the night sky). “North Central Florida has the highest density of first-magnitude springs in the world,” The Losen added while enjoying a glass of Drift, FM’s English dark mild ale. 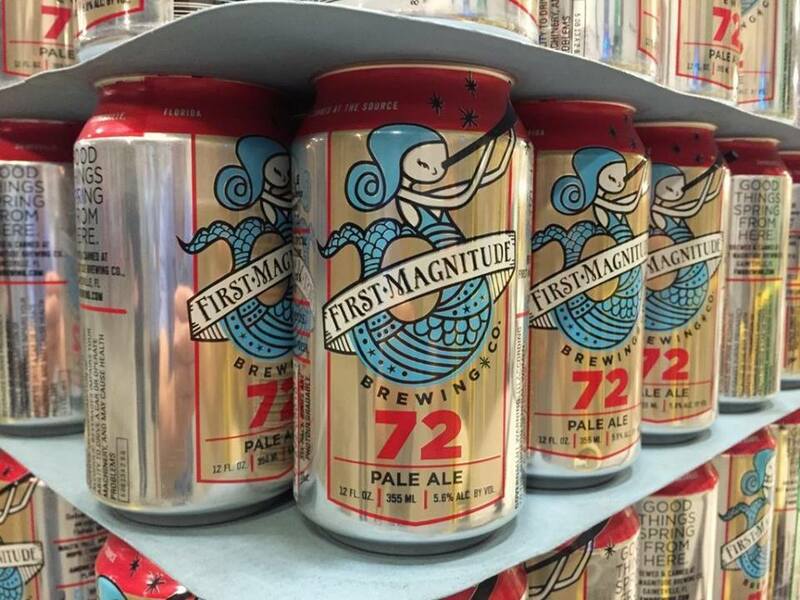 First Magnitude’s 72 in cans. 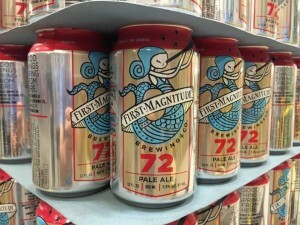 In fact, the name of each First Magnitude beer—Drift, Siren (a light blonde ale) and 72 (a hoppy American pale ale)—ties into the watery theme in some way. Seventy-two is the constant temperature in degrees of spring-fed water. FM’s logo, developed by Tracy Bachmann at Gainesville-based PRO iNK, features a mermaid scoping out the heavens with a spyglass. “It has a vintage Weeki Wachee, old Florida feel to it,” The Losen said. The star-gazing mermaid is everywhere you turn inside First Magnitude’s spacious tasting room, The Source, on Southeast Veitch Street. The Source has become a popular gathering spot for people to sample FM’s full line of local brews as well as craft beers from breweries in other parts of Florida. Local food trucks set up outside the entrance to give people something tasty to wash down with their beer. While relaxing with freshly poured pints, visitors can also watch flat-screen TVs or play an assortment of board games, from Trivial Pursuit to Chutes and Ladders. In the adjacent warehouse, activities include beanbag toss and Jenga with oversized blocks of wood. A family-friendly, outdoor beer garden often features live entertainment and special events. In early 2014, First Magnitude moved into its 21,500-square-foot facility that once manufactured doors and, before that, museum exhibits. The building is just a couple of blocks from the Depot Park redevelopment project and adjacent to the Gainesville-Hawthorne Trail extension. The four-co-founders, John and Christine Denny and Wells and Meg The Losen, met through a mutual friend 15 years ago. John Denny, who has a PhD in higher education, left his job as associate director of the UF Honors program to focus on being the head brewer. Meg The Losen has a background in software marketing and strategic planning at Info Tech while her husband is experienced in production management as owner of Ridgway Roof Truss Co. John Denny has homebrewed for two decades while his wife has strong communications skills through her work with Normandeau. First Magnitude is Gainesville’s second production brewery, after Swamp Head, which began in 2008. The area still has a lot of catching up to do to approach the number of small breweries found in cities like Asheville, N.C., Burlington, Vt., and Portland, Ore.
John Denny is co-host of Homebrew Talk, a monthly show on Gainesville’s internet-based radio station, Grow Radio. The show has been running for over four years and combines educational topics about making beer at home with humor and pop-culture. Denny met Dreyer through the Hogtown Brewers, a Gainesville craft-brewing club. Dreyer, a Pompano Beach native, also has been involved with the group’s Hogtown Craft Beer Festival each spring. Dreyer, the self-professed “geek of the operation,” is involved in every step of the brewing process, from measuring the ingredients to filling the kegs. Each barrel contains 31 gallons, so the 15-barrel system can yield 465 gallons of beer in one “brew day,” or batch. In addition to its three year-round beers, First Magnitude produces seasonal brews and special releases. “Our pilot system allows us to experiment with new recipes that we can release in our taproom,” John Denny said. “[Variety] is what beer consumers want,” added Dreyer, who has been known to put in 16-hour days at the fledgling brewery. Still, Dreyer said he wouldn’t trade his job for anything. Visit First Magnitude on the web. Follow First Magnitude on Facebook.